Paradise is just a bath tub away! Relax and soften the skin without having any clean-up afterward. Simply put the desired amount into the Muslin bag and steep in your tub, just like a cup of tea. Spicy Lime & Pina Colada Oils, Coconut Flakes. Wild Rice (soothes irritated skin), Orange Citrus Oils (uplifting, soothes anxiety), Vitamin E (antioxidant), Spicy Lime & Pina Colada Oils, Coconut Flakes. 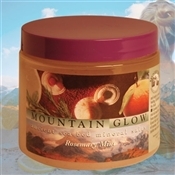 Mountain Body Products | 4th Heart Chakra Dead Sea Bath Salts Mountain Body Products | Handmade Artisan Soap Mountain Body Products | Mountain Glow Mineral Salt Scrub -16 oz. - Rosemary Mint Mountain Body Products | Tropic Blended Massage & Bath Oil - 4 oz.